Corporate author: organo oficial de la Rama Zanoni de la Seccion Espana de la Sociedad Teosofica1/1, January 1921-December 1923. 32-8 pp., 7.50 pesetas in Spain, 10 in Europe and America, and 15 in the rest of the world. This was the organ of the Zanoni branch of the Theosophical Society (Adyar) in Spain, founded in 1918 by de Broude (1885-1932), a physician and political reformer. 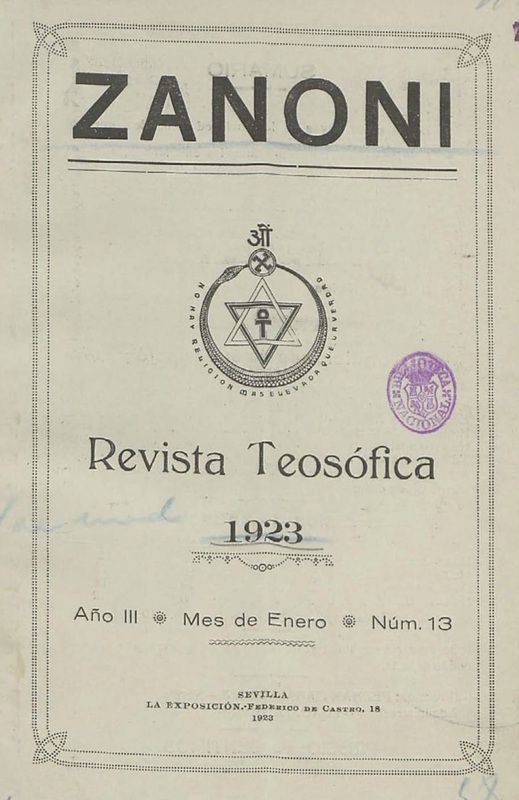 Articles by and excerpts from Besant, Leadbeater, Krishnamurti, et al., but also articles by Alice Bailey, Hiram E. Butler, William Wynn Westcott, and most notably articles by Mario Roso de Luna, including "El Mago de Logrosan," and an important exchange in 1922-1923 between Roso de Luna and others on the mage and confidence man Alberto de Sarak, Conde de Das. The journal noted in its last year that 750 copies of the journal were printed monthly, 150 of them going to paying subscribers and the rest being distributed free of charge to the American branches of the society. In all, at the end of 1923 the journal estimated its loses over its existence at 1,500 pesetas. The journal was the successor of an earlier, short-lived journal published by the branch shortly after its foundation that was distributed for free despite a cost of 50 cents to produce. The branch was extraordinarily active and sought initially to be "independent" of the Spanish Section. This fostered its reputation as a rebel and exclusive and it was required to normalize its relationship with the society and was told to change its journal from a branch organ to organ of the Spanish Section and to change the name to Sophia, the name of the the section's earlier journal, which had been quiescent since 1914. The journal reluctantly agreed to this but promised its readers in its last issue that, if Sophia had not been revived within three months Zanoni would reappear. Noted in "Primero Passos de la Teosofia en Espana," online at http://usuarios.lycos.es/disidentes/arti65.html. Archivo General de la Guerra Civil Espanola; BNE; Arjuna Lodge, Barcelona, online at arjunabarcelona.files.wordpress.com.